An immigration rally on the National Mall ended in several arrests Tuesday afternoon. The "Camino Americano: March for Dignity and Respect" was held as scheduled despite the Mall being closed for the government shutdown. Several popular Latino artists and members of Congress were also in attendance to call on Congress to approve comprehensive immigration reform. During the afternoon, dozens of people broke off from the main group and blocked 1st Street NW, in an attempt to show how much they are willing to put on the line for immigration reform and a path to citizenship. According to Capitol Police, 200 demonstrators refusing to move were arrested around 4 p.m. and charged with crowding, obstructing and incommoding. 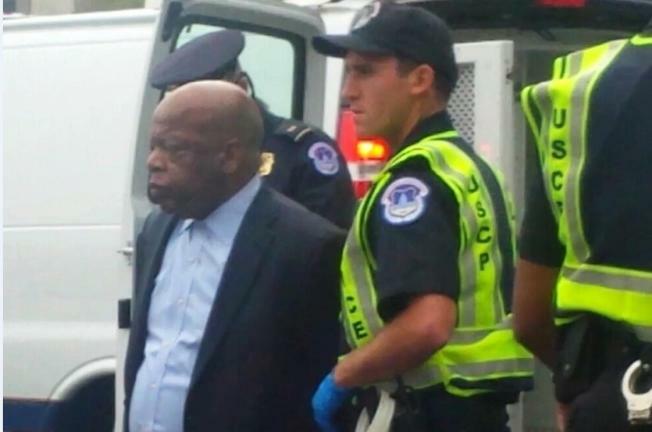 Included were several Democratic congressmen, including civil rights activist Rep. John Lewis (D-Ga.). The government shutdown has made the usually bustling National Mall quiet. But that will all change Tuesday when two groups with opposing views hold immigration rallies on the Mall. News4's Melissa Mollet has more. The other congressmen arrested were Rep. Keith Ellison (D-Minn.), Rep. Raul Grivjalva (D-Ariz.), Rep. Joseph Crowley (D-N.Y.), Rep. Al Green (D-Texas), Rep. Luis Gutierrez (D-Ill.), Rep. Jan Schakowsky (D-Ill.) and Rep. Charlie Rangel (D-N.Y.). Earlier in the day, D.C. Mayor Vincent Gray fired up the crowd, yelling, "We're not going to stop until this is done, ladies and gentlemen!" At the same time, a smaller group of local residents, Help Save Maryland, held a counter rally near the Capitol. That group wants jobs for American citizens and not amnesty for those in the country illegally. They also want the House of Representatives to "terminate the Senate Amnesty legislation passed earlier this year and enforce immigration laws." 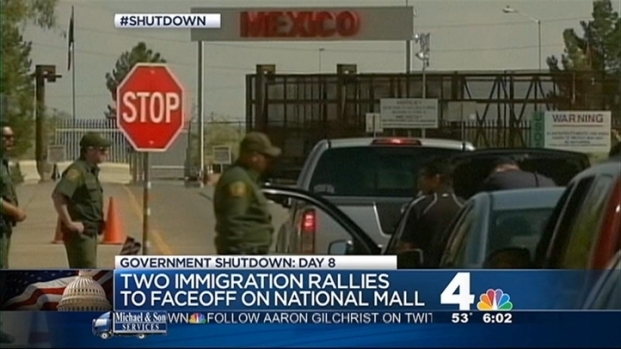 "The Mall is supposed to be shutdown because of the government, yet the Park Service apparently helped this group of illegal immigrants set up this rally today," Brad Botwin said.